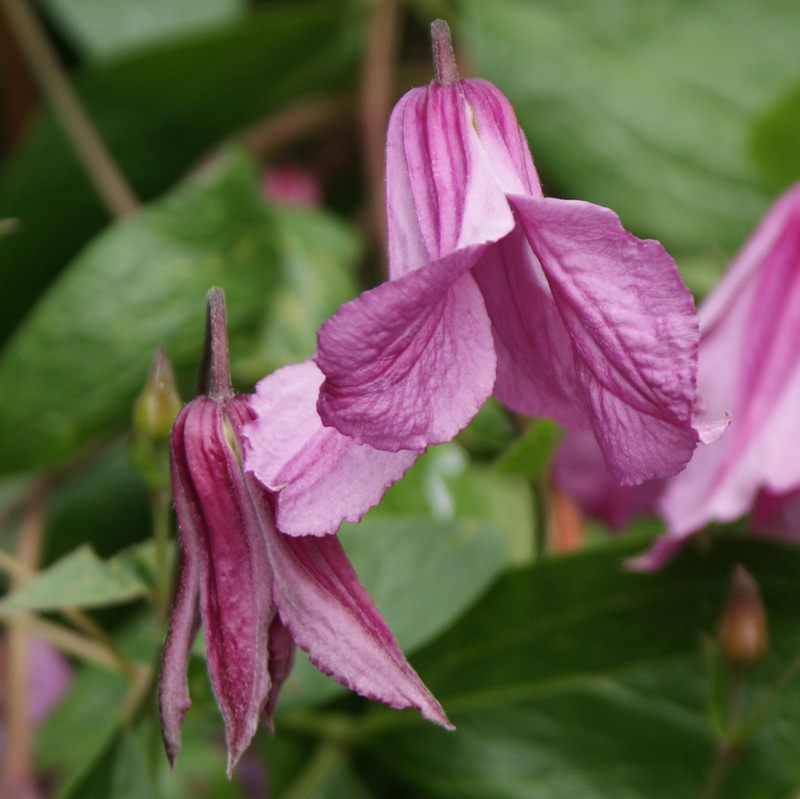 Clematis 'Alionushka' - Hugely abundant and very prolific in flower. 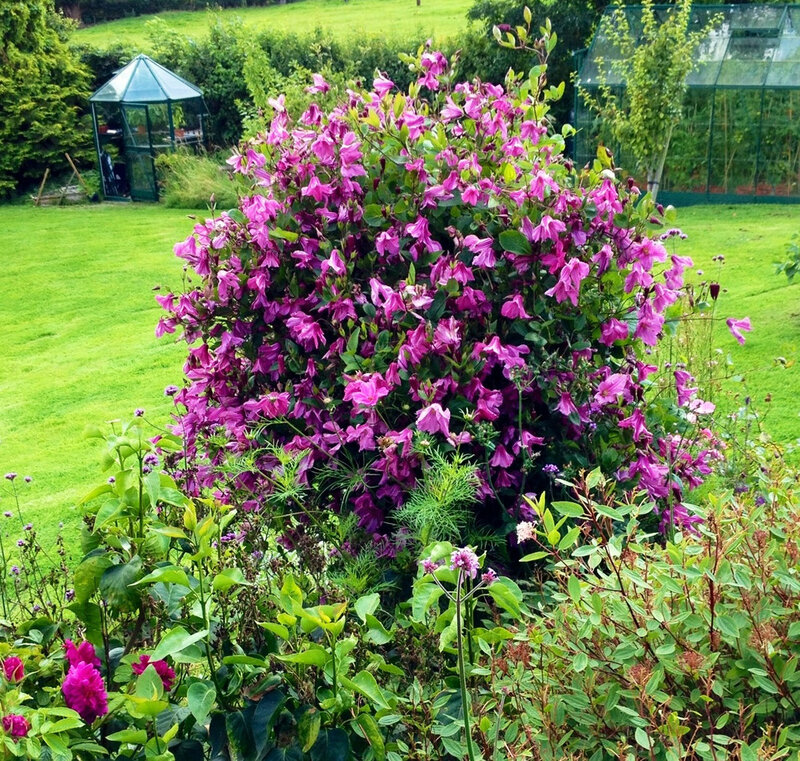 A really super scrambling clematis. 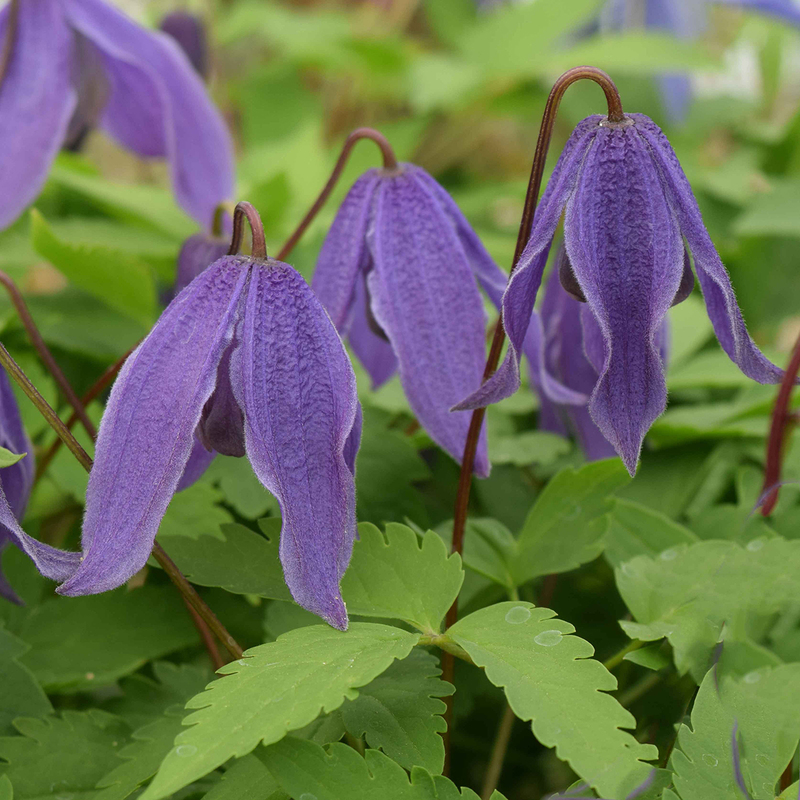 Bred in the Crimea in 1961 by A.H. Volosenko-Valensis and M. A. Beskaravajnaja this clematis is a very hardy plant indeed, meaning that it is popular across the whole of Europe and very much at home in an English garden. 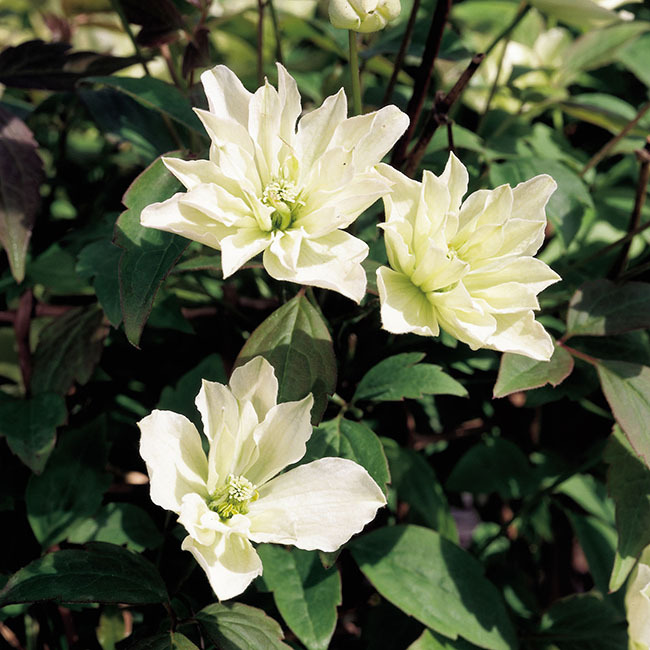 'Alionushka' is classified as part of the Diversifolia family of clematis, these have been crossed between a climbing clematis and integrifolia, meaning that the leaf petiol (leaf stem) does not cling or wrap around things like they do on most other clematis. Therefore 'Alionushka' and other Diversifolia scramble around unless they are given a support and are trained onto it, for example an obelisk. ‘Alionushka’ and other Diversifolia scramble around unless they are given a support and are trained onto it, for example an obelisk. Another attribute that you will notice is the almost herbaceous nature of ‘Alionushka’, where the new shoots come from the crown or very lowest woody stems. 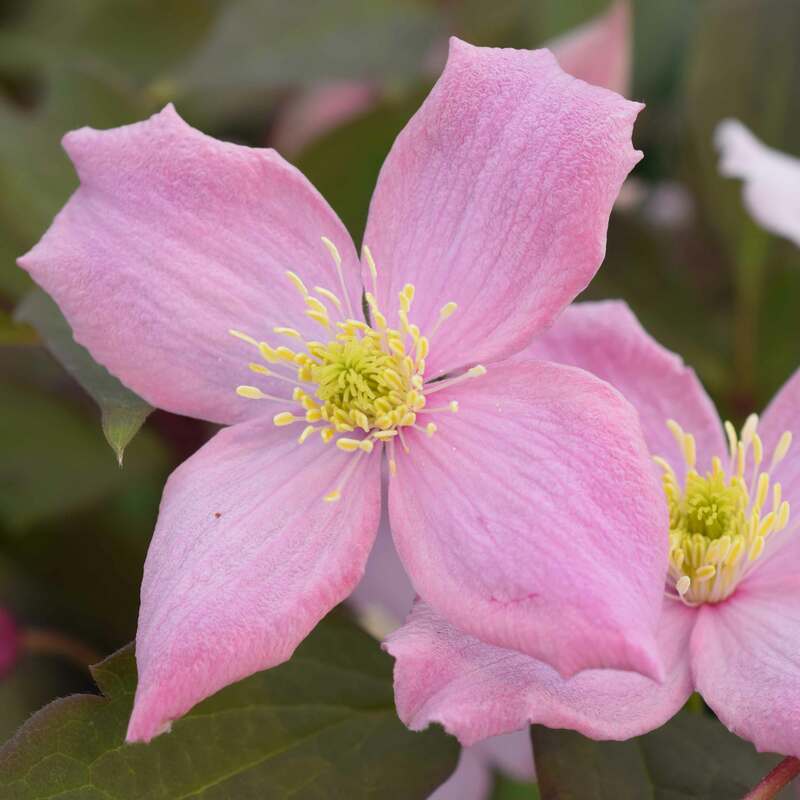 In spring there is a profusion of new pink shoots at the base of the plant, quickly growing up to give a mass of lush new stems which will eventually reach as much as 5-7 feet depending on the soil type. 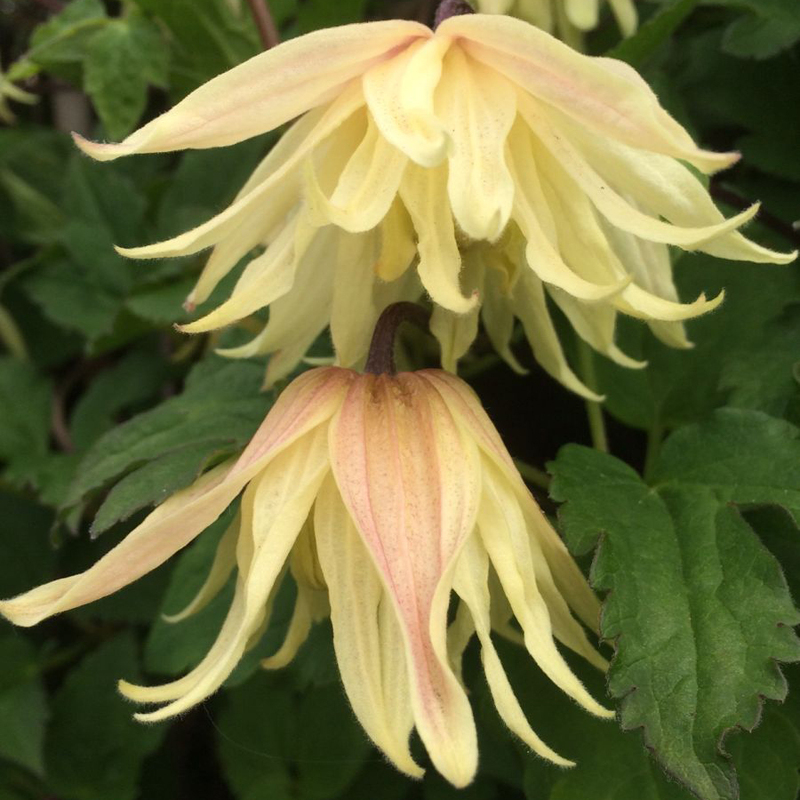 'Alionushka' has beautiful deep mauve-pink nodding bell-shaped flowers, often with twisted tepals, and a darker bar and anthers of pale yellow-green. The flowering is very consistent and almost constant from mid-June to mid-September in the UK. Pruning is best carried out in the mid spring each year, cutting all the stems down to around 4-8 inches from the soil, just above a new shoot. If you like to tidy the garden for winter, you can prune it back to around 3 feet in the late autumn once it is dormant to tidy it up but avoid cutting it too short particularly in harsher climates. Photographed here in an allotment garden in Sweden. I have particularly fond memories of a plant of 'Alionushka' at the nursery which grew inside a large iron obelisk on a bank of earth next to a wonderful hazel tree. They were not too close together but near enough that the flowers of 'Alionushka' shone out against the dark leaf of the nut tree, a wonderful sight from my grandmother’s sitting room chair. 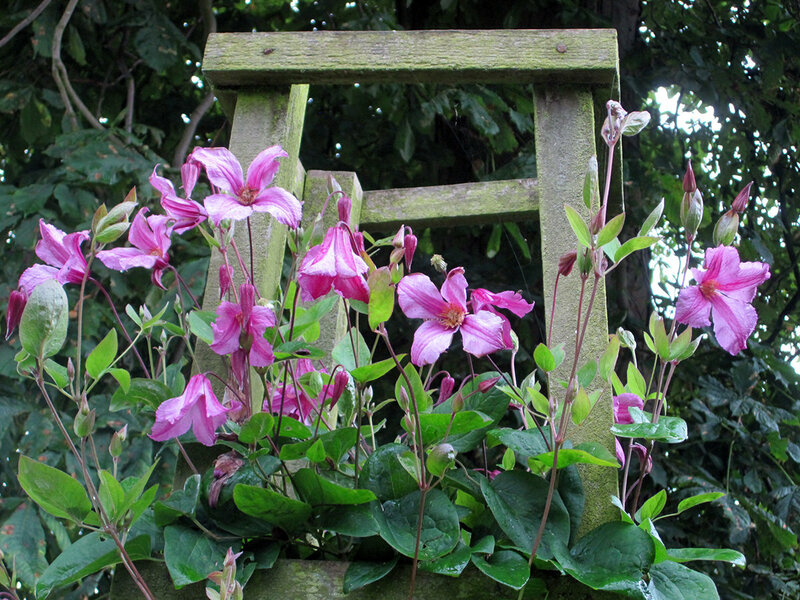 The question is... How will you use your clematis 'Alionushka'? 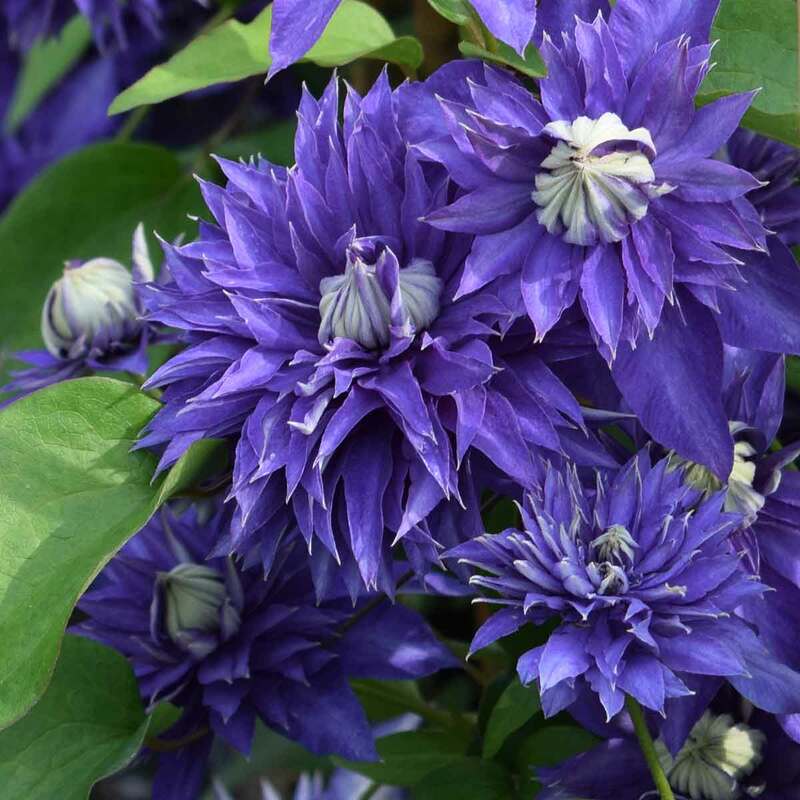 Buy Your Beautiful clematis 'Alionushka' Here! Clematis Montana ‘Fragrant Spring’ - Full of buds and strongly scented. The montana clematis are looking great! 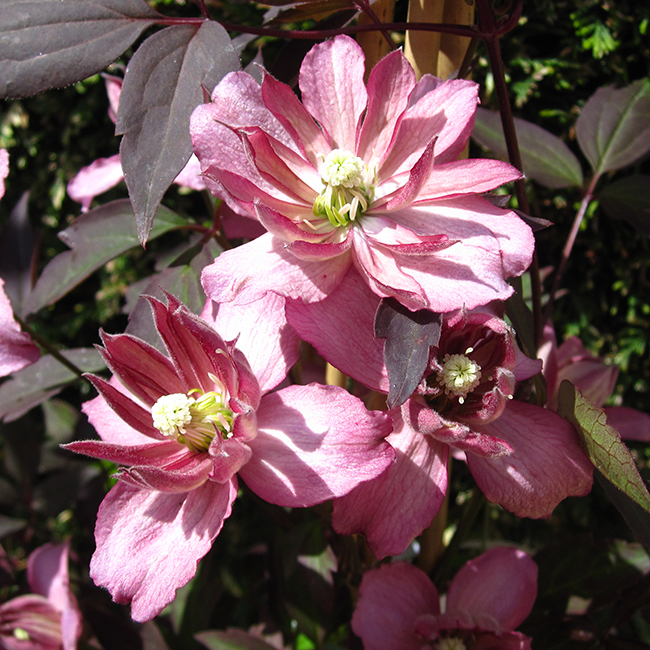 Montana are some of our favourite clematis because we were national collection holders for several years. 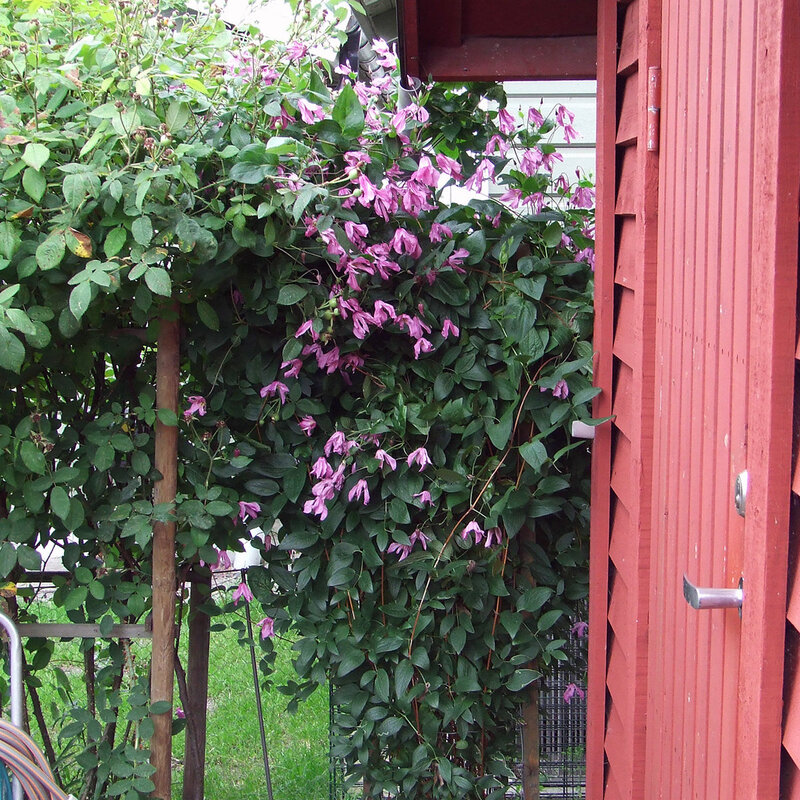 They are great value for money and are some of the easiest clematis to care for and many have a wonderful scent. Simple pruning and a huge abundance of flowers make them real show stoppers in the garden and they can be used to hide a multitude of things under their dense foliage which is often nicely coloured and they make excellent screening plants because of this lush growth habit too. Don’t go thinking all montana are monstrously large plants though, because we have a few that will suit even the smaller garden space, so read on. Hover over images to get more info about the plants. montana 'Freda' is a much more manageable montana than some of her larger cousins. She grows at a more sedate pace than many making her easy to train. Freda makes up to 20 feet eventually. The pretty deep rose-pink star-like flowers have paler bars, undulating margins and recurved tips. Its gorgeous reddy-bronze foliage matures to purply-bronze, altogether a wonderful sight. Pale pink rounded flowers have a delightful fragrance when grown in the sun. A reliable and popular montana we have grown for many years. A classic rounded montana flowers of deep mauvy-pink against a rich bronze foliage. Less invasive than some montana and easy to train. The eye-catching satin white flowers have rounded tips, lightly ruffled margins and contrasting bright yellow anthers. A really rampant grower! Very pale primrose yellow semi-double blooms are very abundant on this lovely prolific flowering montana, one of the more compact growers suitable for smaller gardens. Super on a sandy or free draining soil. Semi-double flowers of deep cherry-pink are borne in great abundance. The young leaves are a rich purply-chocolate, paling slightly as they mature. One of the more compact growers suitable for smaller gardens. So what gift do I buy for Mum on Mothers Day? 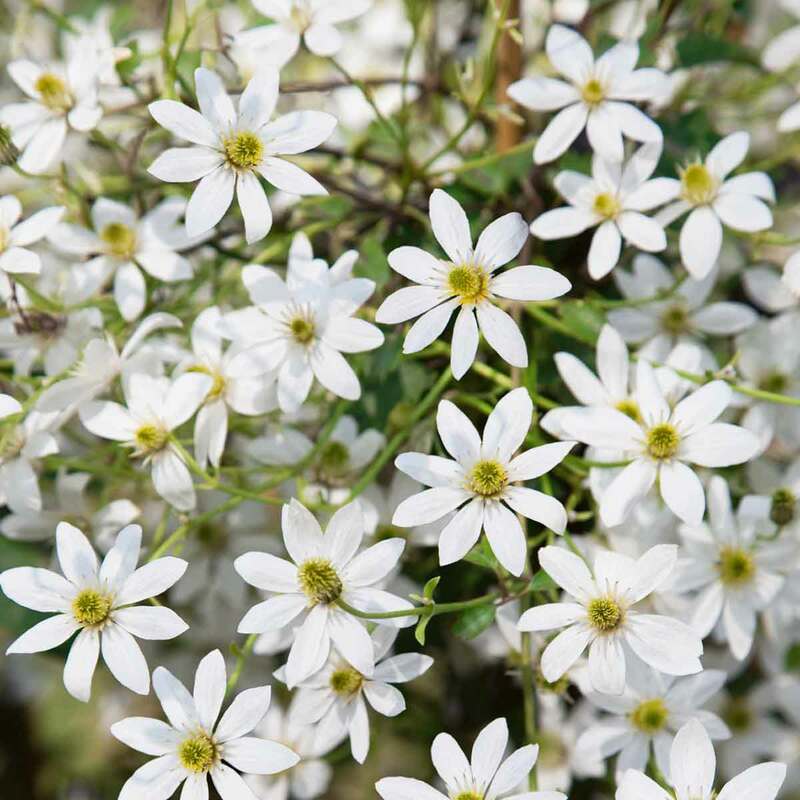 We will be pleased to help by giving you some ideas about what clematis could fit the bill, some climbers that could fill a corner and if in doubt, a gift card will allow her to pick her own! Don't forget at the checkout stage you can enter a personalised gift message to go in to the parcel with your gift. Does your mum like to make a statement? 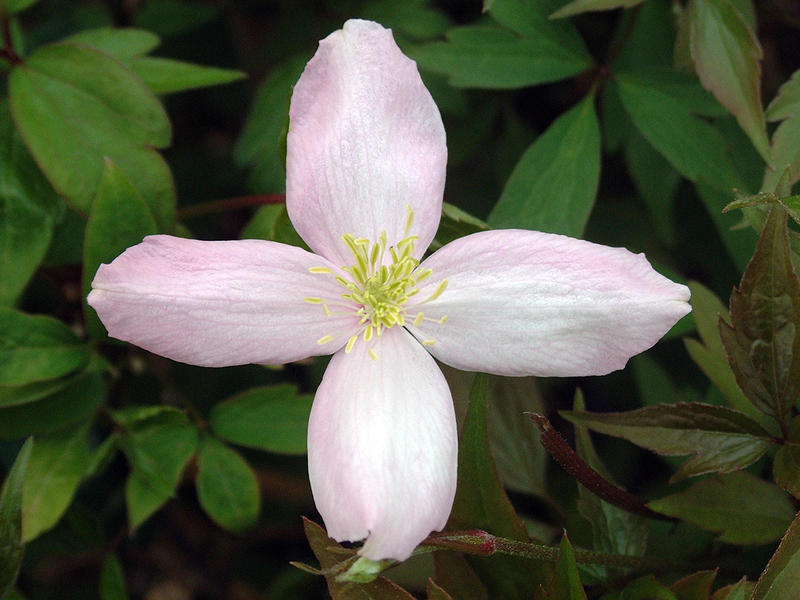 Then how about Clematis 'Taiga'® pictured below? 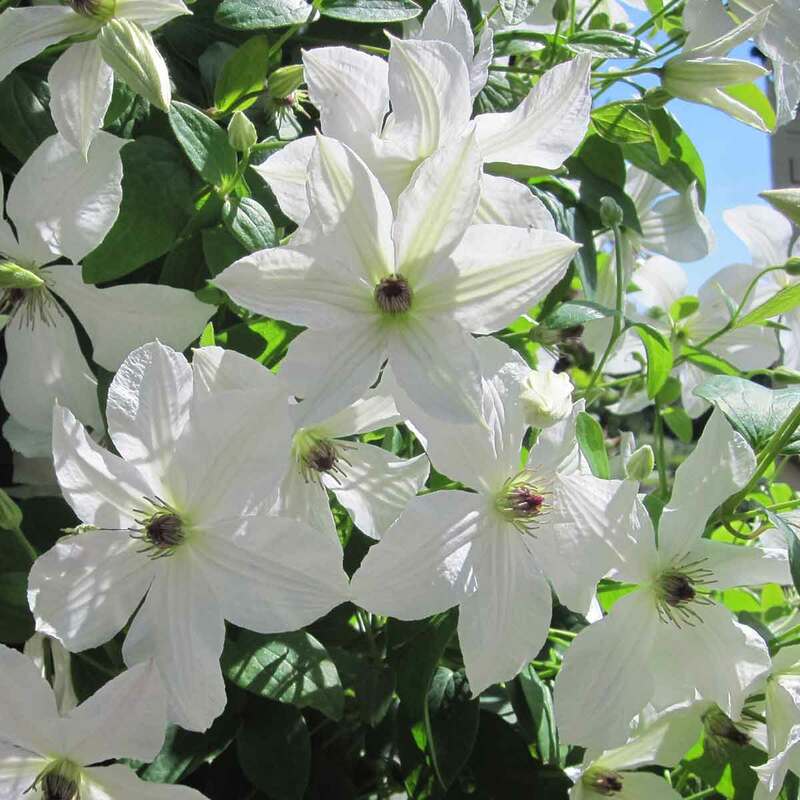 - This amazing clematis will really catch the eye this summer with its exotic flowers that bloom from June through to September each year. 'Taiga' is a strong plant suitable for the garden or even a patio container and will fill an obelisk with flower all summer long. 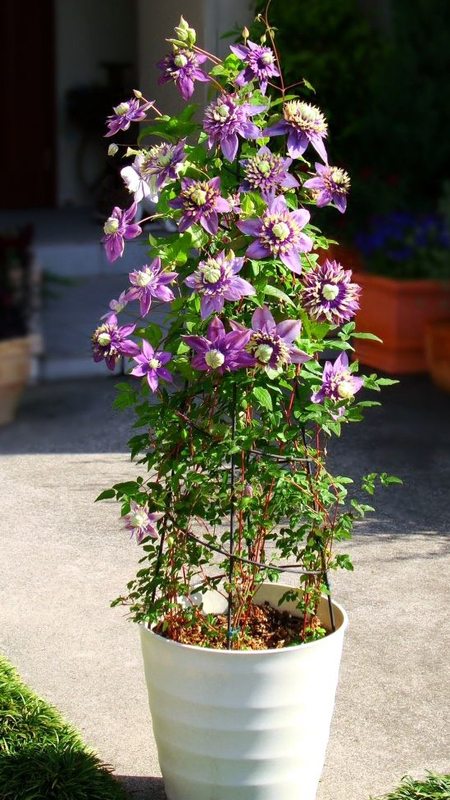 Look at this Clematis 'Taiga'® in a big patio pot. Use 2 plants to get this effect. A little less flamboyant but with a lovely name for Mothers Day is the clematis FOREVER FRIENDS 'Zofori' a very prolific and pretty climber. Fast becoming a favourite of ours - Its beautifully textured satin-white star-shaped flowers have contrasting dusky red anthers. 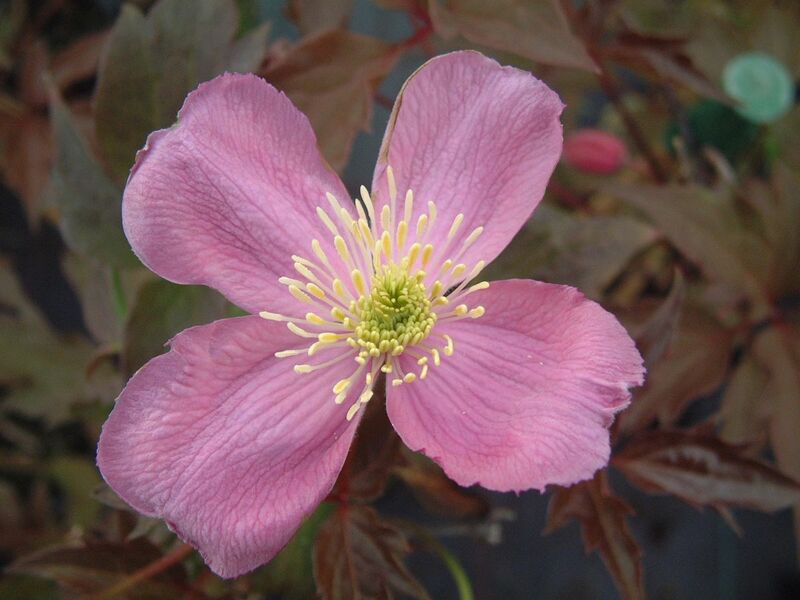 Exceptionally free-flowering from June to September! 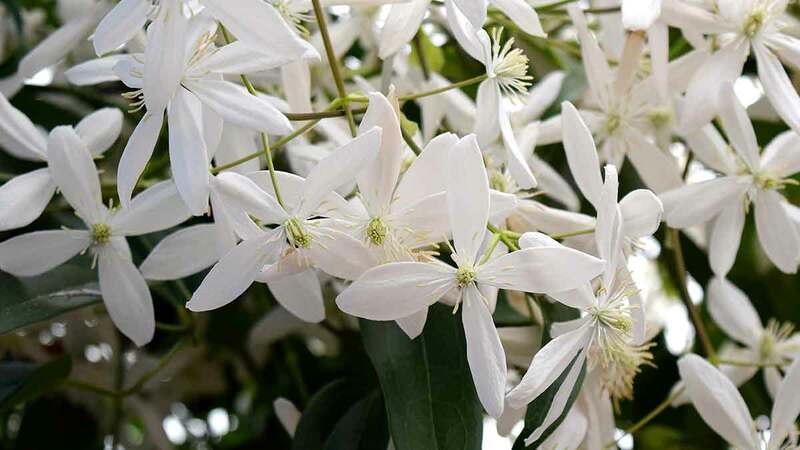 Featured in one of our recent emails, the armandii family of clematis are from a hotter climate than ours so they all prefer a slightly more sunny situation in the garden to give a really good scent. These strong evergreen climbers are some of our favourites because of their natural vigour, wonderful dark green leaves and sweet fragrance. Buy Scented Armandii - IN BUD & FLOWER! Maybe you'd prefer to send something that will flower at this time of the year. Gently nodding flowers of primrose yellow are double and have a slight hint of pink on the top near the flower stem. The single nodding bell-shaped flowers are deep bluey-purple. Awarded the RHS Award of Garden Merit. 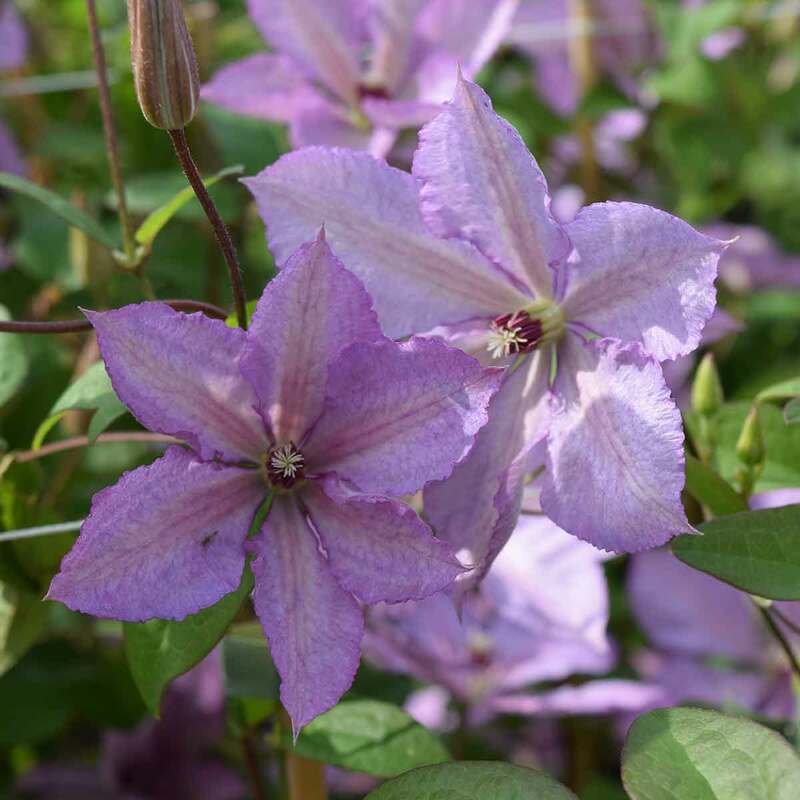 On our nursery this is one of the favourite spring flowering clematis and it is very hardy too. Or maybe its just a nice variety of colour you'd like to send. Look at these stunners below! If you are still unsure which she would like best, why not give a Thorncroft Clematis Gift Voucher. Available in £5, £10 & £20 denominations. Wishing you happiness whatever you do this Mothers Day. Please share this email using the links below. We have had some good news and we just wanted to share what we have been up to. The RHS Chatsworth Flower Show is our last flower show for 2018 and we are delighted to report that we have been awarded a Silver-Gilt medal for our exhibit! The display is an updated version of the Malvern Spring Festival exhibit using what we have learned and showing the judges that we can improve using the constructive criticism they give us. We hope you enjoy this short video. 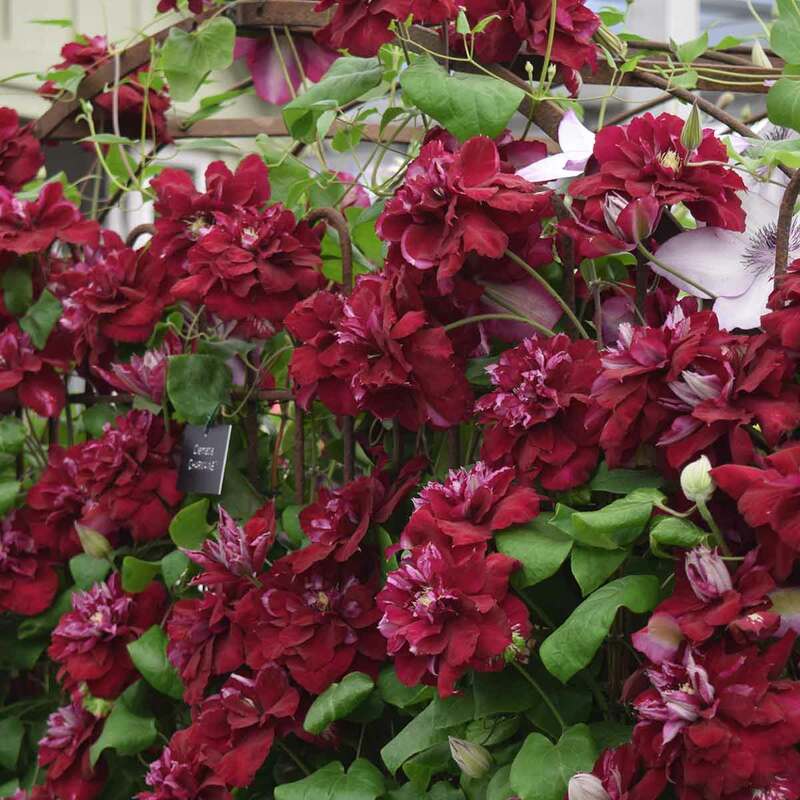 We are delighted to announce that we have been awarded our 11th Gold Medal at the RHS Chelsea Flower Show! The judges loved what we had done with the reclaimed supports and containers, which they said gave gardeners inspiration to try something new and even opened their eyes into how versatile clematis can be. Check out our Youtube channel for video's of the show build up but here is the finished article and below the BBC Coverage as well. Enjoy! Video about the structures Mongers are using to create our Chelsea Flower Show exhibit this year. See Our Full Collection Online NOW! Here is a little taste of what to expect!